Enter Argyle Feed Stores Chili Cook-Off, November 26th! 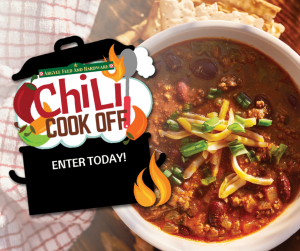 Sign up to participate in Argyle Feed Store’s first Chili Cook-Off! It’s free to enter but you must register to participate. The date is Saturday, November 26th from 12:00 PM – 3:00 PM at Argyle Feed Store. Argyle Fire Department will be onsite from 12-3Pm and is one of the judges of the Chili Cook-Off. Register online below by November 21st! Argyle Feed Store will provide water, bowls & spoons. We’ll have games on site for folks to participate in. This entry was posted on Sunday, October 30th, 2016 at 1:58 pm	and is filed under Events, News & Updates. You can follow any responses to this entry through the RSS 2.0 feed. Both comments and pings are currently closed.